The main purpose for using Dermal VitalityTM Vital Repair Night Cream is for hydrating your skin and keeping you moisturized while you sleep. Hyaluronic Acid (a natural product our body produces) diminishes as we age. As a main ingredient, it helps add and retain moisture while protecting the outer layers of your skin. Jojoba Oil and Scotch Thistle Extract aid your skin's ability to heal from free radical damage. 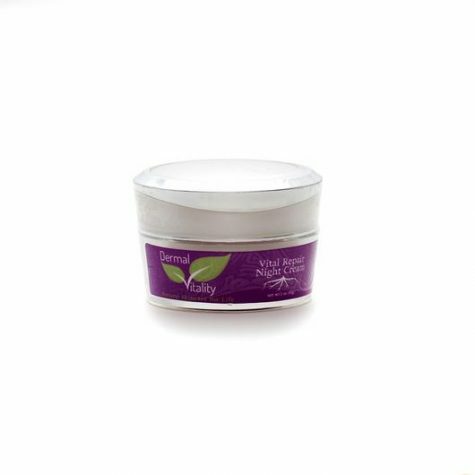 Dermal VitalityTM Vital Repair Night Cream improves skin elasticity, boots collagen production and skin cell proliferation, and reduces the appearance of fine lines and wrinkles. Directions: Remove all make up and clean your skin. Apply Vital Repair Night Cream to face neck and decollete` before bed time. Wake up to softer, rejuvenated, younger looking skin. Ingredients: Purified Water (Aqua), Simmondsia Chinesis (jojoba) seed oil, Squalene, Hyaluronic Acid,Candelilla/ Jojoba/ Rice bran Polyglyceryl- 3 Esters, Onopordum Acanthium flower/ leaf steam extract, Glyceryl Stearate, Cetearyl Alcohol, Sodium Stearoyl Lactylate, Glycerin, Cetyl Alcohol, Hydrogenated Palm Kernel Glycerides, Hydroxypropyl Starch, Phenoxyethanol, Ethylhexyglycerin, Xanthan Gum.